- The hair turns deep gold; flows upward into thick, slanted spikes; bangs tend to hang down over the face and sides of the head. Anime Perspective: The aura is changed to a “golden ambiance” which is semi-clear. Whereas the Aura was always present before, it tends to come and go in the Anime without any sort of consistency. Also, the hair is changed to yellow as opposed to golden. The power-up sequence is lengthened significantly. - Muscle mass increases significantly. - Based on what little we see of this form, it seems the user tends to rely on single-hitting strong attacks, and much less on rapid attacks. This may or may not be a side effect of the extra bulk presented in this state. Anime Perspective: The aura is changed to a translucent series of repetitious golden waves, which constantly travel upward. Whereas the Aura was always present in the Manga, it tends to come and go in the Anime without any sort of consistency. Also, the hair is changed to yellow as opposed to golden. - Each hair strand becomes very large and juts out extremely far. - Because of the incredible increase in muscle mass, the Saiyan finds himself incapable of moving in any sort of fast or fluid manner, leaving them completely useless against an opponent with any kind of speed. Theoretically, this stage would be extremely effective against a large group of much weaker opponents. Anime Perspective: The Aura is changed to a translucent series of repetitious golden waves, which constantly travel upward and outward. Whereas the Aura was always present in the Manga, it tends to come and go in the Anime without any sort of consistency. As opposed to the previous forms, this one tends to generate sporadic cackles of electricity, as well as blacken the skies above. Also, the hair is changed to yellow as opposed to golden. - The hair spikes stand as far upward and on end as possible, with the occasional tendril hanging down in front of the Saiyans face. - A side effect of this incredible level of power is that warriors now inflict damage upon one another at a rate greater than previously seen, and the landscape suffers great damage even from missed punches. Anime Perspective: The aura is changed to a translucent series of repetitious golden waves, which constantly travel upward. Whereas the Aura was always present in the Manga, it tends to come and go in the Anime without any sort of consistency. Also, the hair is changed to yellow as opposed to golden. The streaks of lightning are removed and replaced with an occasional bolt of blue electricity, which only lasts a half a second or so, and tends to not reappear for quite some time. There are a couple of exceptions, where there the same blue bolts scrambled chaotically around their bodies during sequences where they were waiting for one another to attack. Oozaru: When exposed to the light of a full moon, a Saiyan involuntarily transforms into a giant ape-like beast. 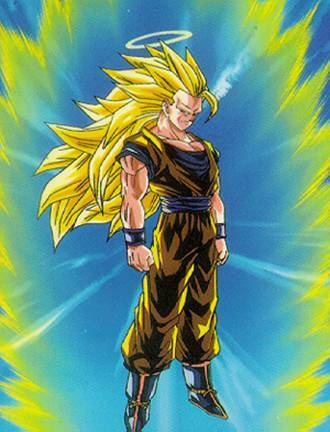 While in this form the Saiyan's power is greatly increased. There are two ways to reverse it, one is to chop off the tail of the Saiyan, and the other is to get rid of the source of moonlight. Behold the Ultimate Super Saiyan!!! This transformation marks the end of the progression of Super Saiyans, and is the greatest culmination of Saiyan power when naturally realized. Only 2 warriors every unlocked this state, one of which is a fused warrior. This is also the only Super Saiyan stage capable of matching up against the series’ final central antagonist – Majin Boo. The exact requirements for bringing forth this power aren’t even really known, because it isn’t explored with much depth. - The hair grows several times in length, down to the back of the waist or knees (depending on users own height). - The demand of Ki required to tap the awesome power the Super Saiyan level 3 makes it so that it can only be freely used in the afterlife. When used in the living realm, it causes the user to either borrow against time before returning to the netherworld, or completely drain oneself of all power after just a few minutes of transforming. It may well be impossible to access the full power of this state in the living realm. For fused fighters, this stage can be used freely, but with a time limit of 5 minutes. Anime Perspective: The Aura is changed to a translucent series of repetitious golden waves, which constantly travel upward, except for when Goku first showcased the form during his fight with Majin Boo. A good deal of the time, the aura bowed out in all directions, appearing as a constant spark of light. Whereas the Aura was always present in the Manga, it tends to come and go in the Anime without any sort of consistency. Also, the hair is changed to yellow, as opposed to golden. The streaks of lightning are removed and replaced with an occasional bolt of blue electricity that scrambles through the air, occasionally striking and destroying pieces of the surrounding landscape. Golden Oozaru: A level that was achieved by Goku and Bedi-Vegeta in Dragon Ball GT. This is the most powerful form of Oozaru, actually, the most powerful of all stages that a Saiyan can achieve, demonstrated by Goku in DBGT episodes 38-40, when he swatted Bedi-Vegeta all over Planet Plant (Bedi's recreation of the Tsufuru home planet.) The main physical difference with the Ougon stage, is that the fur is yellow instead of brown. Also before Planet Vegeta was taken over by the Saiyan, it was also called "Planet Plant", of coarse before renamed to Planet Vegeta.